Route summarization helps reduce OSPF traffic and route computation. OSPF, unlike EIGRP, doesn’t support automatic summarization. Also, unlike EIGRP, where you can summarize routes on every router in an EIGRP network, OSFP can summarize routes only on ABRs and ASBRs. All three routers are running OSPF and exchanging routers. Before OSPF summarization is configured, the router R1 inside the backbone area has two entries for the networks 11.0.0.0/24 and 11.0.1.0/24 in its routing table. Be careful with summarization. 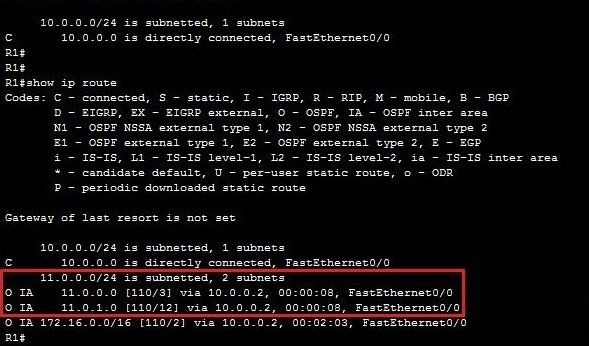 In this case, router R1 thinks that R2 has routes for all subnets in the range 11.0.0.0 – 11.0.255.255. When summarizing, try to be as specific as possible.